Finance and Public Expenditure Minister Paschal Donohoe. PRESSURE IS MOUNTING on the government to increase the 9% VAT rate for the tourism sector. With money for tax cuts and fresh spending amounting to just €300 million, the Minister for Finance and Public Expenditure has limited funds to play with. Just two weeks out from the Budget, Paschal Donohoe was before the Oireachtas Budgetary Oversight Committee yesterday. While he said he would not be revealing any specific details relating to the budget, he did rule out any big surprises on 10 October. While some trade unions have urged the government to abolish the special 9% VAT rate for the hospitality and tourism sectors, those in the industry are understood to have expressed deep concern about any potential increase. However, the minister admitted to the committee yesterday that the VAT rate is under consideration, adding that the rate had served its purpose during the recession. It’s understood that Fianna Fáil has not put up any roadblocks to an increase, with one source explaining it is not a measure contained in the confidence and supply agreement and if Fine Gael wants to push on with tax cuts, it will need to find additional expenditure from somewhere. One Fine Gael TD said an increase is on the cards in this year’s Budget as hotels are “back booming”. “They don’t have a case to make. Hotels are almost at 100% capacity, they are making money, and I do not for one minute believe an increase will result in job losses,” said another TD. The VAT rate was reduced during the economic downturn from 13.5% to 9% in a bid to boost the tourist sector and retain jobs in the industry. There’s speculation that the government won’t return to the 13.5% but will perhaps increase the rate nominally to 10%. However, the Restaurant Association of Ireland said a 1% increase could put 6,000 jobs at risk. Donohoe said he believed the rate reduction has worked well over the years. “I believe it played a valuable role, at a point in time, in relation to the creation and retention of jobs,” he told Fianna Fáil’s John Lahart. “At a point in time?” asked Lahart pointedly. “At a point in time,” replied the minister. 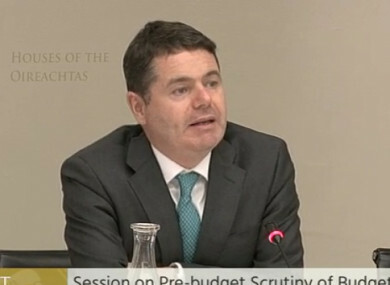 “It is a matter under consideration by me and others and I have made no decision in relation to it and I will announce what we are going to do on Budget day,” said Donohoe, who added that it was a measure of “where we were in the economic cycle and played a positive role in the creation and retention of jobs”. “And what I will be doing now is looking at the economic evidence in relation to that tax rate, as I will with every other rate,” he said. Lahart also asked the minister if his department had evidence of price gouging by the hotel industry, particularly at times of big events. The minister said any changes in hotel price rates send out a signal about Ireland’s competitiveness and send out a signal regarding the “ability of people to come and visit us”. I also said that I understood that the setting of price levels in that sector was needed to, in turn, make the construction of more hotels and more hotel rooms available and what I can see, and am aware, and share some of the concerns of people, regarding the pricing of hotels in Dublin, I can also see the delivery of more hotels and more hotels rooms. The minister said that the hotel sector in Dublin is not necessarily reflective of the industry nationwide. He explained that he would not make any decision on the tax rate based on one city, “even if it is our capital”. “I know from going to other parts of the country that they continue to experience difficulties in relation to the development of tourism and getting people to stay. I will be looking at the national performance of that tax and not just in our capital city,” he concluded. In addition to discussions on VAT, the minister hinted the government may seek to divert funding for various rental support schemes, such as the Housing Assistance Payment (Hap), to local authorities for the building of social housing. He also confirmed that there would be another Christmas bonus this year, though he would only make the details known on Budget day. What can we expect in the next Budget? Donohoe also confirmed that there will be a “Brexit package” in this year’s Budget. During an unusual line of questioning, where the minister was asked if he would be a “Coca-Cola” “Coke Light” or “Coke Zero” drinker, Donohoe said he enjoyed many forms of fizzy drinks. He said the introduction of a sugar tax in 2018 had been well-flagged and said the tax would be applied to sweetened drinks which have sugar in them. Email “The tourist industry could lose its 9% VAT rate as it's 'under consideration' for Budget 2018”. Feedback on “The tourist industry could lose its 9% VAT rate as it's 'under consideration' for Budget 2018”.